When you think of cranberries, what is the first recipe that comes to mind? For me, I pictured our Thanksgiving and Christmas dinners and the dish of cranberry sauce on the table beside the turkey. I also think of leftover turkey sandwiches with mayonnaise and cranberry sauce – yummy! Really though I wasn’t even scraping the surface to just how many cranberry recipes there are out there just waiting for me to make. Cranberries can be used in baking and there are loads of bread, muffin and cookie recipes out there online. It can also be used in savoury dishes to add a bit of tartness. I’ve purchased dried cranberries (Craisins) in the past and grab a quick handful for a snack. I’ve collected 41 mouthwatering cranberry recipes to try if you want to go beyond the traditional cranberry sauce recipes. I’m not sure which one I want to make first though since they all look fantastic. What is your favourite cranberry recipe? Great list of recipes! I must admit I’ll be sad when cranberries are no loner around which is why I’m definitely freezing some this year! It will be wonderful when I can make some of these recipes in the Spring! 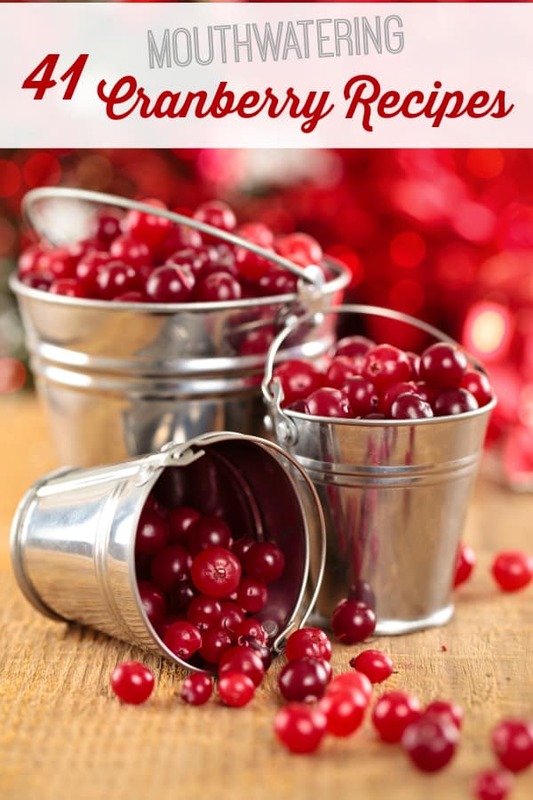 Wow what a large collection of awesome cranberry recipes, I love cranberry around the holidays. So delish! Cranberries are so gorgeous, I love using them in so many things! Thanks for including my muffins here! I love the sound of the cranberry muffins and the cranberry pecan bread. Thanks! I love Cranberries! I think they are the best side dish to make with Pork Roast and Turkey dinner. I sometimes make homemade Crannberry sauce just to eat it! I like a lot of these recipes! I will have to try some of them! I have never made anything with cranberries, this is inspiring! I love cranberry relish and dried cranberries too. I never seen so many recipes to use cranberries in before. Thanks so much for all of them. I will share these with my daughter in law. I love cranberries and I will probably make the Cranberry Cheesecake muffins and the Cranberry orange bread. I enjoy the taste of cranberries so I will definitely be trying some of these recipes. I want to try the Cranberry Apple Pie Spring Rolls. Yum, everything looks so delicious. I want to try the Cranberry Apple Pie Spring Rolls, the Cranberry Sauce Mini Cheescakes, the Dark Chocolate Cranberry Brownies, the Cranberry and Chocolate Trifle, and the Brie Crostini with Sparkling Cranberry. My favorite is the Dark Chocolate Cranberry Brownies, dark chocolate is my fave. Thank you for sharing these links. Good list…long and sound good. I really want to eat more cranberries. I keep hearing about all the benefits, but just haven’t gotten into them yet. Thanks for the recipes. I love cranberries- the Crock Pot Crisp recipe looks like a good one for the season! Lots of cranberry recipes. I like to try the Pear and Cranberry Upside down cake. My favorite cranberry recipe is the after Thanksgiving turkey sandwich, stuffing and cranberry sauce! So yummy!! We have yummy cranberries down here in Massachusetts!! Thank you for sharing all of the cranberry recipes. I can’t wait to try a few of them for Christmas parties I to go to. I’d like to try the Crock-pot Fruit Crisp Recipe. I wonder if it would be best to substitute the cranberries with the berry in the recipe or add to the existing recipe. I love anything with cranberries, such a versatile fruit. Thanks for sharing! I love cranberries so I pinned this so I can try several of these recipes later. I think the first one I’m going try is the Cranberry Orange Bread.